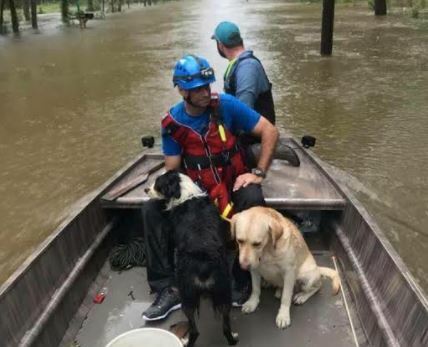 Volunteers for the Islamic Society of Greater Houston rescue dogs trapped in Hurricane Harvey. The Huffington Post: Over 200 displaced individuals spent the night in ISGH’s [Islamic Society of Greater Houston] makeshift shelters on Tuesday, said Mohammad Amin Moola, the group’s vice president. The number was rapidly rising on Wednesday, he added. “We will definitely be opening more,” Moola said. “We are not turning anyone away. Whatever we have, we are sharing.” Muslim restaurants in the community have also been providing free food to those in the convention center, passing out hundreds of meals even as the hour grows late. Click here to read more (external link).